I am still searching for information about my father Stefan Malinowski. He emigrated to Australia in 1950. 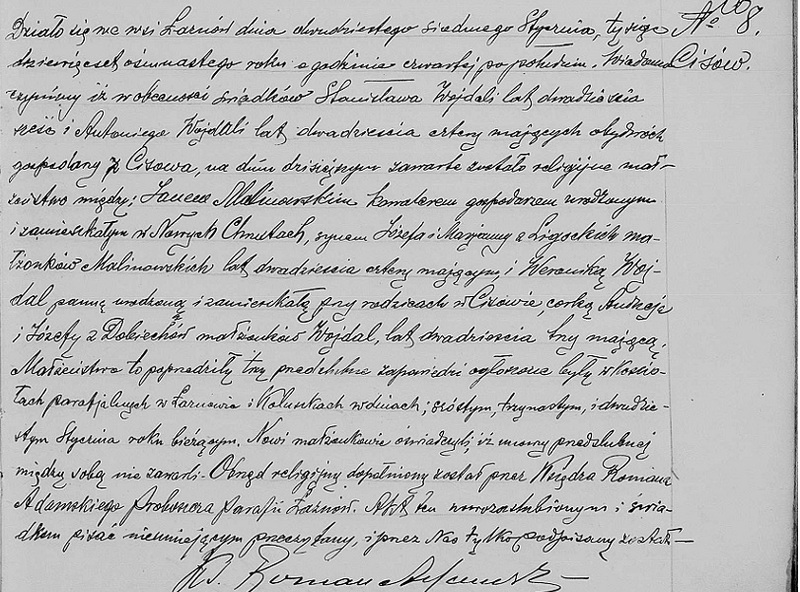 On his naturalisation form he lists Weronika Kotyia as his birth mother who was married to Jan Malinowski. Stefan was born in Laznowek on 29/8/1925. Stefan died in 1964. He left Poland in 1943 as a forced exit and remained in Germany until 1950. Is their anyone that could shed light on his past ? My family tree has no information on his past. Perhaps he had an alias name. You may already have this information, but here is what I found. I found the passenger list for Stefan Malinowski departing Bremmerhaven for Austrailia on the SS Nelly 11 May 1950. I also searched for the title page of this section of the passenger manifest to read the column headings. This is what was written on the title page of the manifest: "International Refugee Organization; Group Resettlement to Australia; Nominal Roll of Emigrants Departing from Delmenhorst on SS Nelly sailing from Bremmerhaven 11 May 1950". I also looked at the column headers to better understand your father's line entry. It seems he was travelling with his wife, Lottie (age 22), and his 9 month old baby son, Walter. Stefan was 25 years old at the time, born 29.Aug.1925 in Laznowek, Poland. His wife, Lottie was born 11.Jul. 1928 in Wahlstedt, Germany, and their baby was born 14.Oct.1948 in Bad Segeberg, Germany. This suggests they met and married in Germany around 1947. His occupation is listed as "driver". The entry also indicates he was a past inhabitant of the Follinghostel Camp for Displaced Persons which is where he received his passport. These camps hosted refugees who were displaced by Nazi Germany during the war either to/from concentration camps or forced labor camps. I also found an admittance entry for a Stefan Malinowski to the Sauchenhausen labor camp in Germany for 17 May 1941. I do not know if this is your father because you said he left Poland in 1943. If you are sure of that date, then this 1941 admittance record is not for your father. That is all I was able to find. Since he was once at Follingbostel, it is possible that he was deported from Lodz, Poland by the Nazis as forced labor to one of the camps in Germany. It is difficult to find such records, but you might want to check online for Lodz ghetto records. As a young man living about 40 km from Lodz ghetto, he may have been conscripted by the Nazis for labor as were many young Poles. Check your PO inmail box. I just sent you something. Thanks to Henryk posting the location of the online records for Laznow, I think I found the 1918 marriage record for your grandparents. The groom is Jan Malinowski, but the bride is Weronika Wojdal (not Veronica Kotyia as you mentioned in your original post). The only way to prove this record is your grandfather's is to find the 1925 birth record for your father, Stefan. There are no online records for Laznow, Lodz that I can find for 1925. That means you will still need to contact either the civil records office at Rokiciny per the information I gave to you earlier, or you will have to contact the parish in Laznow for the baptism record. The civil records office should not give you a problem because you are a direct descendant, i.e., daughter. I am attaching the 1918 marriage record. It is written in Polish, so you can post it to the Polish translation forum for help in translating it. From what I can see (which isn't much): the date of the act is 27 Jan 1918. The groom is Jan Malinowski, age 24, blacksmith (?) living in and born in Nowy Chrusty, son of Jozef and Marianna born Lingocki (?). The bride is Weronika Wojdal, age 23, living and born in Cisow, daughter of Andrezej and Jozefa born Doleiech (?). 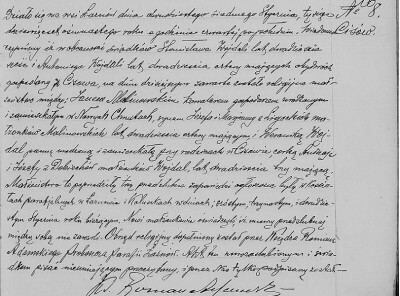 I searched all marriage records for this parish from 1890-1924 and this is the only Jan Malinoswki with a bride named Weronika. I suggest you just hold onto it until you confirm it by getting your father's birth record. The witnesses, Stanisław and Antoni Wojdal, are probably relatives of Weronika.